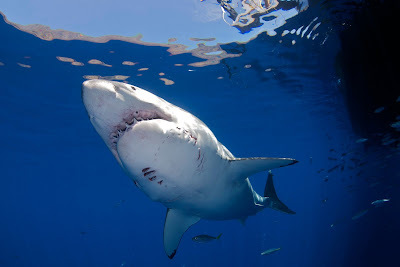 Isla Guadalupe Shark Season in FULL SWING! With trips #3 and #4 now complete, I can say that we are now in FULL SWING and the action has been non stop. With the arrival of Zapata (Bruce) on trip #4 everything just got crazy! Zapata is definitely hands down one of the Tres Grandes Tiburones at Isla Guadalupe. Zapata is a legendary player and favorite to many of us at the island. Even being so large and healthy, I'm sure he must have had an unfortunate encounter with a shark bigger than almost put him out of the game. 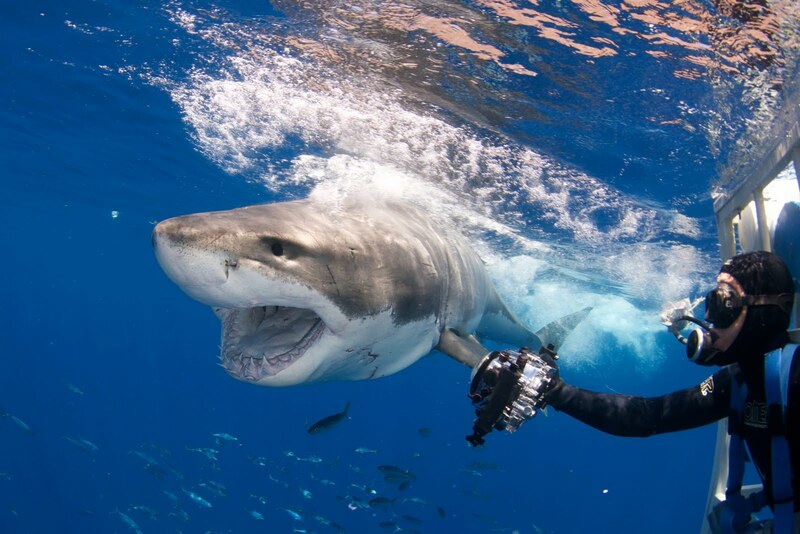 Zapata is 14 feet long and my best guess would be that the shark that bit him twice from below and across his throat must have been considerably larger possibly 18 to 20 feet long. The wound extends from his right side lower gill area all the way across to his left jaw line. Although the wound looks horrible and must be painful we have seen wounds like this before on other sharks and they heal amazingly fast. I am sure he will be just fine in a few weeks. 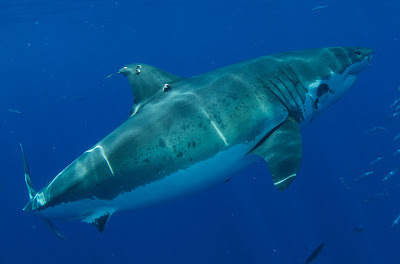 These wounds on the larger males are results from epic battles with other huge mature white sharks. This male on male combat would be just incredible to see and has never been documented.. YET! However Zapata has also had a run in with the "Expedition Great White" Tag Team and has a transmitter bolted on his dorsal fin. 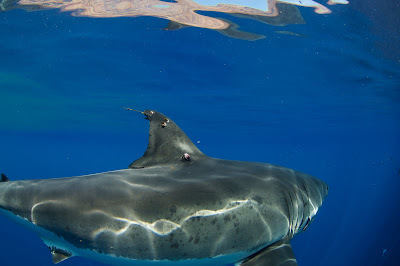 He even has an acoustic tag on his lower left dorsal area. So we are off once again and I have to go. I wish I had more time to write. I will be back in 5 days and will try to give a more detailed report then. We had 15 sharks over the 3 days at IG and we had our first breach! May the Sharks Be With You!